Xperia XZ Premium is the premier phone from Sony. So what this means is that, all previous Sony flagships such as the XZ, and others, are all incorporated into this device. If you know about the Z5 Premium, then, this is an advance flagship of that. As if that is not enough, this phone has the latest Snapdragon 835 processor with 4k resolution and HDR, which makes it impossible for other top smartphones such as Samsung Galaxy S8 , HTC U11 as well as LG G6 to compete. All these being said, let's take a detailed look so we would have to make a wholesome judgment rather than with the afore-stated only. 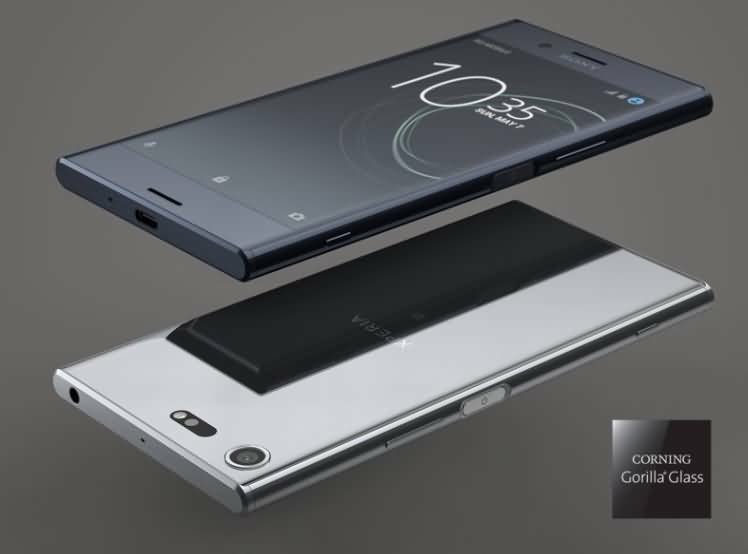 While many popular smartphones are featured with curved edges and rounded corners, Sony followed the outdated industrial design for its Xperia XZ Premium. This 4K smartphone is not mobile friendly with its thick bezels to and bottom design, makes it mimic the outlook of a dated device. Such lag would have been considerably entertained if it wasn’t the latest flagship of Sony but because it is, it looks awkward to overlook such lag. The Xperia XZ Premium is uncomfortable to hold because of its large size and its sharp corner. 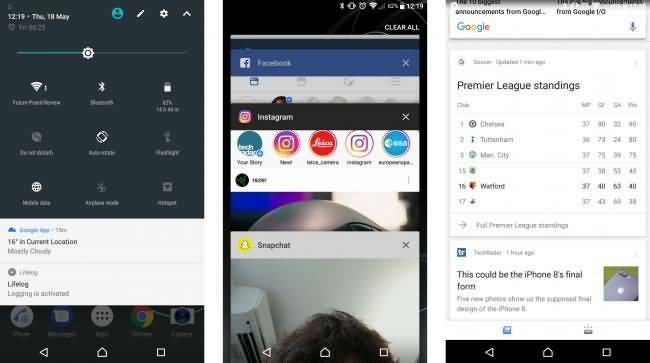 If you want to use it one-handed, you will find it is hard for you to reach upper screen and the corners will dig into your palm. Though Sony adopted Gorilla Glass 5 on the front and back, the rear glass on this XZ Premium is unbelievable slippery. Any angle will cause it to slide. On the left side of the XZ Premium, there are a dual-SIM and microSD card slot which are accessible through a flap. This phone is charged via a USB-C port which supporting Quick Charge 3.0. The fingerprint sensor is intergrated with the power button, however, it is disabled in the US. 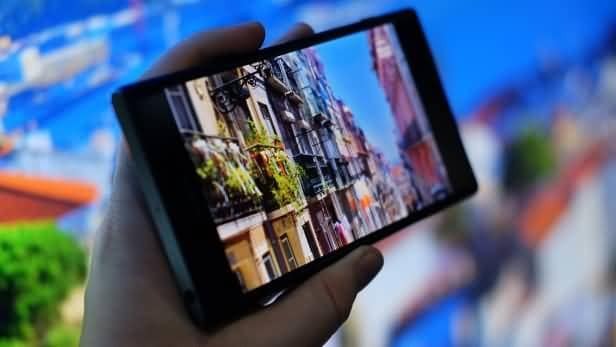 The Sony XZ Premium has a great and awesome display, which earned it the day world’s first 5.5 inches device with (3,840-by-2,160) HDR IPS display smartphone. It is the first smartphone with a 4K HDR display in the world. In case you cannot decipher the math properly, this means a wholesome of 807 pixels per inch. One more thing is that; unlike preceding devices which has a stumped up view of the 4k display, this device runs the 4k experience on all section of the device. However the great testimony about this device, we have one complaint about the panel. The color of this panel is somehow unrealistic. In spite of the fact that it does feature three display presets, which you can choose from in order to change the way color are displayed. Either: super vivid, standard, and or professional mode. While the professional mode is meant to present the best display mode, the sky-like over saturated hue is somewhat weird. Nevertheless you can still custom switch between them. For the time being, this Sony seems to be the first mobile manufacturer to have announced the Snapdragon 835. Apart from this imaginable processor, the XZ Premium also comes with a 4GB RAM, which makes it pretty much-performing phone. Thinking about these customizations, one would reasonably conclude that it will be another oven. But surprisingly, this device seems to be an opposite of rational assumptions. It also comes with a 64GB storage, which is expandable with a MicroSD. One more positive with the XZ Premium is with its IP68 dust and water resistance, which leaves you with the confidence of using your phone anywhere without being scared of it absorbing liquid. The phone has a strong and reliable internet and network connectivity. One of the recently test done in Midtown Manhattan, a solid network connectivity was recorded with an optimal download speed of 11.41 mbps. Such level of connectivity that comes with this phone is also related with the fact that it supports Cat 16 LTE with a 4x4 MIMO, which allows it attains gigabit download speed. In addition, it also supports dual-band, Wi-Fi and NFC. 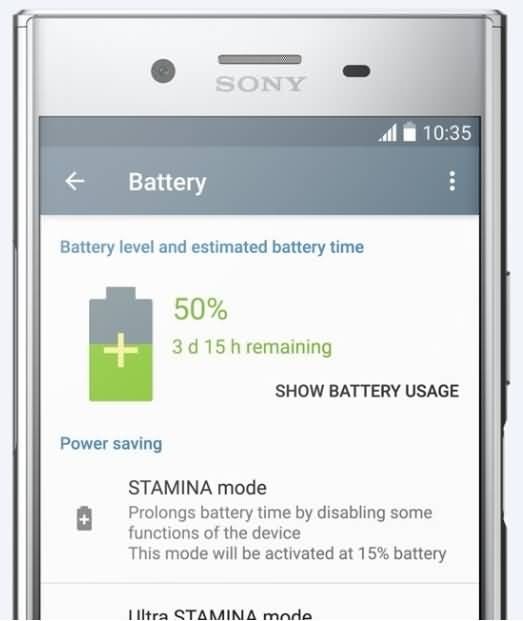 The Sony XZ Premium smartphone has a battery rating of 3,600mAh, which is almost dated when compared with released as 5000mAh by Infinix and Techno. However, it is still a more sufficient capacity. The battery life is somehow disappointing. This is related to the fact that the phone consumes a lot of power especially when you are playing games and real-time usage. However the disappointing battery life, it can be very good for everyday use if you can have a better usage, like turning off the Wi-Fi when not in use and some other features like your data and Bluetooth. Meanwhile the phone has an unprecedented fast charging technology that supports the 3.0 charging tech, which might leave you less worried about the battery life as it takes no longer time to sip it in again. Sony XZ Premium support the latest Android 7.1.1 interface. The interface is quite pretty easy to navigate and use. If you have been a Sony user, then this will give you no heck as it is possible to get used to the interface and how they function within some hours. The interface is pleasing and sight beautifying, as well as intuitive and fantasizing. As known over the years, one thing Sony has long been known for is with their preinstalled applications. This Sony XZ premium comes with some pre-installed app which will give you a reliable feel of the device as some of these apps cannot be gotten for free. So you are given the custom ability to enjoy the device as part of your purchase. One other thing here is that you are not compelled to make use of these apps incase, some may not be suitable to you, you can disable it any time you like. Some major dimensions of the XZ premium that need to be noted is the camera quality. The phone comes with a 19MP back camera and the front camera also has a competitive 13MP with crisp selfies, which is also awesome for real time video chat. The picture quality of the XZ Premium is something that is remarkable. It has a CMOS sensor including a phase detection auto focus that makes is produce enhancing pictures with high definitional quality even in low light. The camera also has an amazing feature that enables it to reprocess any captured image within milliseconds to minimize distortion. In addition to the camera, the Sony’s new MotionEye tech makes it possible to capture fast moving objects. It is now very easy to capture moving objects such as flying birds, moving cars can be capture like they are packed in the garage. 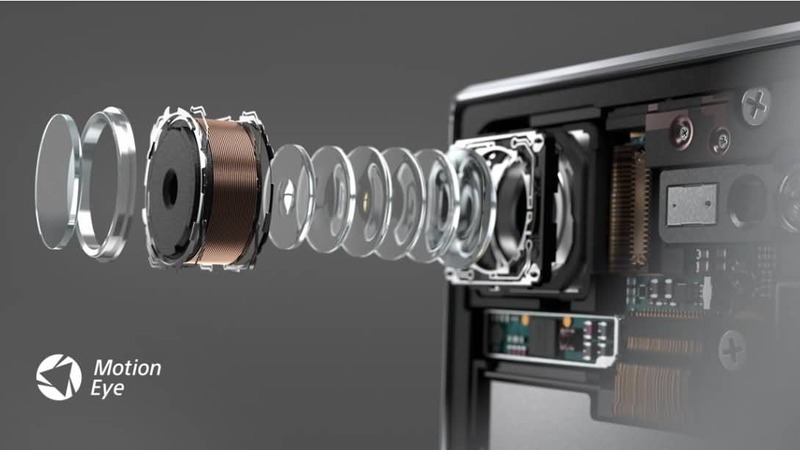 The XZ Premium smartphone is capable of shooting at up to 960 frame per second (fps), which will result in some very cool and pleasant video. Not alone that, you can shoot at 1080p at 60fps and 4K at 30fps. The Sony Xperia XZ mobile is one with such user’s craved audio compatibility. The device supports HD audio with DSD, FLAC, LPCM, ALAC file formats. Those are just the exceptional audio qualities – so you should know that dated qualities like the 3gp, MP4 and the likes are just a perfect walkaway. Also on the superb audio quality, the device comes with the DSEE HX protocol which enables you to enjoy an enhanced quality of your compressed music files. The DSEE HX embedded in this device does this, by employing digital noise cancellation. One close use of this phone shows that the Sennheiser HF630VB headset and the sounds quality was unprecedented. It has transformations such as from crisp highs, mids, low and the likes with great details including a detailed rich bass overlay. The audio quality is not limited to direct fix headsets, it also has great qualitative sound with Bluetooth headsets. The device supports almost all spectrum of Bluetooth devices such as Bluetooth 5.0, including LDAC codecs. Although the Bluetooth 5.0 is yet to be compatible with any headset, the XZ premium helps you evade such limitation by enabling you to stream audio with improved quality. One more feature of this device that cannot be left out is with its low motion recording and capturing. With its ability to capture as much as 960 frames per second, it makes it a more presentable camera, which is relatively four times the speed of a thing. This enables the device to give you a more detailed footage of an event. It also gives you the ability to choose from three different recording modes. From the entry level, to the super slow (one shot) level, then the super slow motion mode. Such custom ability of a camera is unprecedented and it undoubtedly the flagship of this device. Just like as often expected with Sony’s releases, they always come with custom preinstalled apps. The XZ Premium is not coming short of this. It came with the Android 7.1.1 Nougat with Sony’s custom user interface running together with it. There are numerous apps on this XZ Premium, here we want to mention Lifelog and PS4 Remote Play apps. The Lifelog allows you to measure almost everything about your daily life, from how long you spending on walking to how much time you spend on social media, which can help you to establish a healthier habits easier. With the PS4 Remote Play app, you can play your PS4 anywhere as long as there is a internet connection. It allows you to connect the DualShock 4 control unit to the XZ Premium via Bluetooth. To wrap it up, the device cost around $800 making it one of the most expensive flagship smartphone you will ever find in the market. If you are a die-hard fan of Sony, the XZ Premium is the phone that you are looking for in 2017. It delivers good video quality with a 4K HDR display and 960fps slow-motion ability and MotionEye Technology. In terms of hardware and performance, it matches most competitors with elegant camera quality, 4K HDR display, MotionEye Technology, and high resolution video and audio. However, you can choose other smartphones, such as OnePlus 5, which can also shoot 4K video, if you are sensitive with the high price.